As a writer, there is nothing more important to me than a good keyboard. Seeing as I spend all of my time typing, a keyboard with crisp action makes my life a lot easier. Yesterday, I was typing at my usual hectic pace when my “S” key got stuck. It required too much pressure to hit the key as I typed, so I removed the key to try and fix it. I found what had to be a hairball underneath the key, which was surprising because I don’t have a cat. It took me a minute or two to remove all of the keys from my keyboard, and I was absolutely disgusted when I saw all of the stuff that had fallen between the cracks of the keys. It took me half an hour to clean, and I was amazed by the 101 things that made my keyboard dirty. What Causes Your Keyboard to Get Dirty? Using the bathroom at work? If you forget to wash your hands, all those germs are getting on your keyboard as you sit down to type. Having a quick bite to eat at your desk? Be careful not to splash anything or drop any crumbs, as they’ll get stuck under your keys. Got long hair, a beard, or a goatee? If so, the hairs that fall out are likely getting stuck under your keyboard (hence the hairball under my “S” key). Eating a snack while watching TV or a movie on your computer? If you don’t wash your hands once you finish eating — but just lick your fingers clean like so many people do — you’re getting your keyboard dirty. Which? Computing, a British magazine on computers, hired a microbiologist to test out a number of keyboards for germs. The germs were compared to those found on toilet seats, door handles, and other germ-populated things. Not surprisingly, keyboards earned the title as “The Most Bacteria Infested” items on the list. Did You Know: This is absolutely disgusting — The average keyboard was shown to have five times as many bacteria as a toilet seat, and it was 150 times over the acceptable bacteria limit. Keyboards that are used by dirty people can have as much as 60 times the germs that are found on a toilet. That means that your keyboard is about as dirty as a gas station bathroom — a very, very dirty device indeed! So, the keyboard can be a pretty filthy little device, as you can see. But what can you do about it? 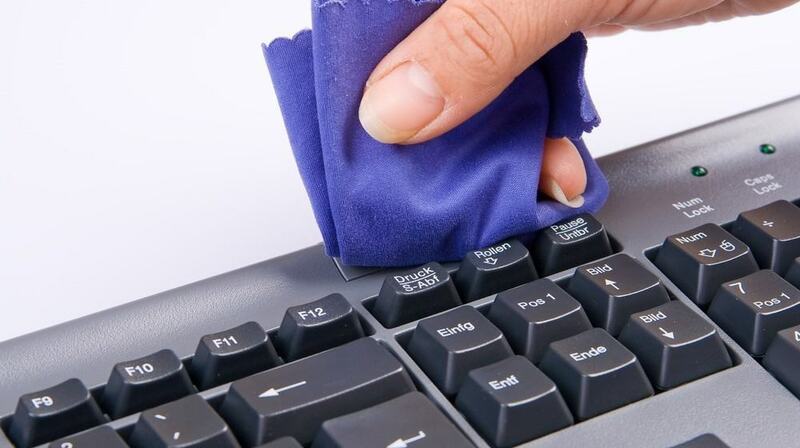 Make sure to clean your computer keyboard at least once a month, if not more often. It takes time to remove all of the keys, get into the cracks with a brush or compressed air, and wipe down each of the keys individually, but that’s just the best way to clean it. Spend an hour doing it every few weeks, and you can avoid the germs. All computer supplies stores will sell compressed air cans, which makes one of the best cleaning tools for your keyboard. The air will blow between the keys, and will help to blow out all of the crumbs, dirt, dust, and hair balls trapped in your keyboard. Make sure to clean out the fans and vents at the same time to keep your computer running properly. Check your computer supplies store to find special antibacterial wipes for your computer keyboard. These wipes will allow you to clean the keyboard without risking getting the device wet, and it will clean off all the germs easily. Use these wipes every week or so, as the antibacterial treatment on the wipes will be the germ-killer you need. No more snacking at your desk, and no more scratching your beard over your keyboard either. Make sure that your hands stay nice and clean, so wash up after using the bathroom and stop eating those Cheetos while watching movies on your computer. Always wash your hands, and use Purell to get your hands clean right before sitting down to type. Lifehack: If you are worried about germs, get yourself a waterproof keyboard. That way, you’ll be able to wash it in the sink regularly to get rid of germs. There is an interesting device that you can use to clean your keyboard of germs, a UV lamp that shines on your device for about 20 seconds to kill off the germs. It will get rid of up to 99% of the bacteria living comfortably on the surface of your keys, and it can be quite effective — if a bit costly. If you don’t want to be typing on something resembling a gas station bathroom store, keep those hands clean and take time to clean off your keyboard!